← 316 "The President Wore Pearls"
The back wall is a Play-Doh Fun Factory press that creates clay figures of the Simpsons. "The Regina Monologues" is the fourth episode of season 15. It guest stars Jane Leeves as Edwina; and Tony Blair, Evan Marriott, Sir Ian McKellen and J. K. Rowling as themselves. 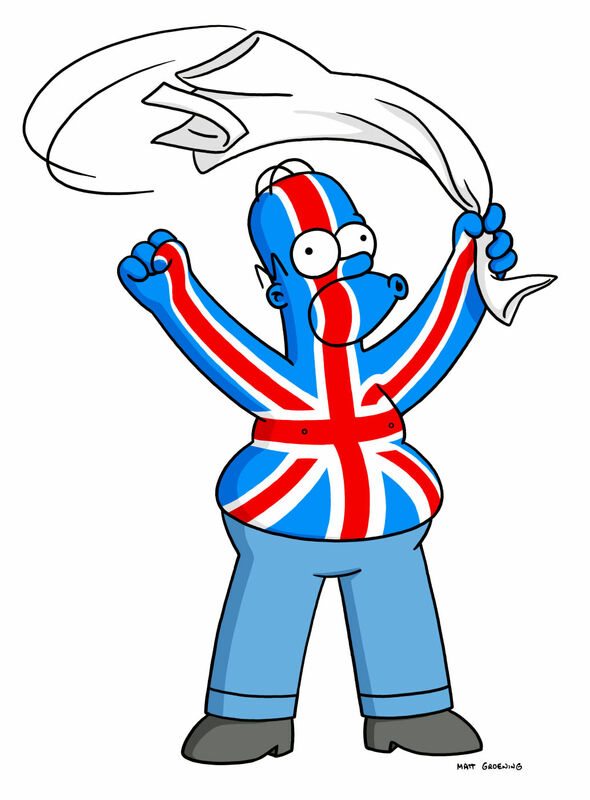 "The Simpsons journey to London, where Grampa attempts to reconnect with a long-lost flame while Bart and Lisa go nuts after sampling British chocolate. After Homer has a fender-bender with a golden coach belonging to the Queen, the family must again plead their way out of a foreign land." Mr. Burns withdraws a $1000 bill from an ATM, but he drops it and an updraft carries it away to the Simpsons' house, where Bart and Milhouse are playing a vicious video game, (Hockey Dad). It flies straight into Milhouse's hair and Bart removes it and keeps it, claiming it was a ladybug. Bart wonders what to do with the bill, but Marge tells him and Homer to put up fliers so the person who lost it can reclaim it. Soon, there is a long line of people outside the Simpson house, all claiming the bill. No one can describe it correctly and Lisa suggests they spend the money on Marge, who wants a vacation, but decides against it because Homer always manages to ruin it. The next day, Bart displays the $1000 bill in school for his friends to see. When Milhouse offers him 25 cents to see it again, he gets an idea and sets up a museum in his tree house, naming it "The Museum of Modern Bart". The museum is a resounding success, however, when Mr. Burns comes in and sees the bill, he claims it as his. When asked for proof of ownership, he shows Bart the bills indentation on his chest. (When the bill was ejected from the ATM, it hit Burns in the chest, knocking him backwards before it was swept off.) Bart is forced to give it back and close his museum, as now there is no $1000 bill, noone is interested in the museum. Lisa says they managed to collect $3000 from the museum so it doesn't matter anymore. Bart wants to spend it on a used Toyota. Lisa reminds him Marge never had an enjoyable vacation. Bart feels upset, looks at Marge, and decides to go on a vacation. Homer says he would like to go back to Brazil, but he has been told the "monkey problem" is worse. Then Grampa suggests using the money to go to London, where he hopes to meet Edwina once more, a girl he met there during World War II. 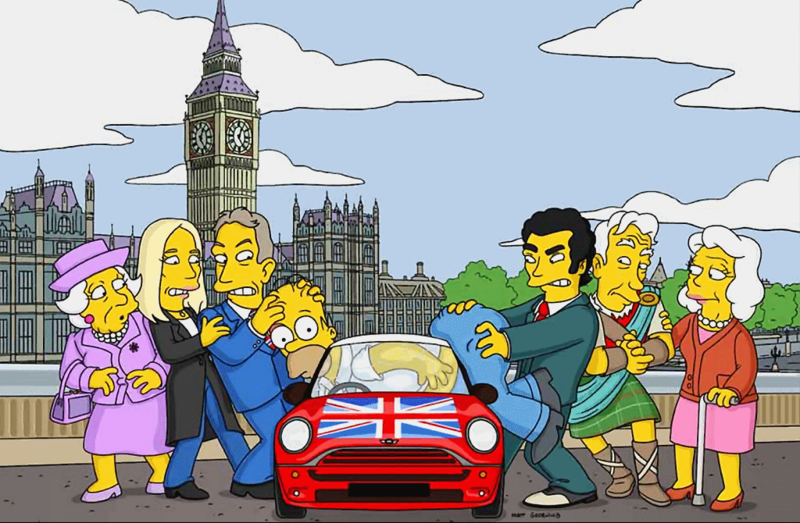 The family travels to London and are greeted by then-Prime Minister Tony Blair, whom Homer confuses with Mr. Bean. They start seeing the sights, while Grandpa stays at the hotel, trying to contact Edwina. Bart and Lisa go on a "sugar trip" after discovering the joys of British chocolate. The family go on to meet J. K. Rowling (of whom Lisa asks what happens at the end of the Harry Potter series) and Sir Ian McKellen (to whom the family gives bad luck by saying "Macbeth" and wishing him good luck before a performance). Marge is astonished Homer is behaving himself. They rent a Mini Cooper and start to drive around London. Unfortunately, they get stuck on a roundabout. After driving in circles for hours, Homer decides to break out of it, plows straight through the gates of Buckingham Palace, and slams into Queen Elizabeth II's horse drawn carriage. Unaware of whom he just knocked down, he tries to brush the incident under the carpet, but the Scottish guardsmen start beating him with cudgels. Then comes the Changing of the Guard, and the new Scottish guardsmen continue to beat him mercilessly. This supposedly continues until the Queen's mention or when they run out of guards. 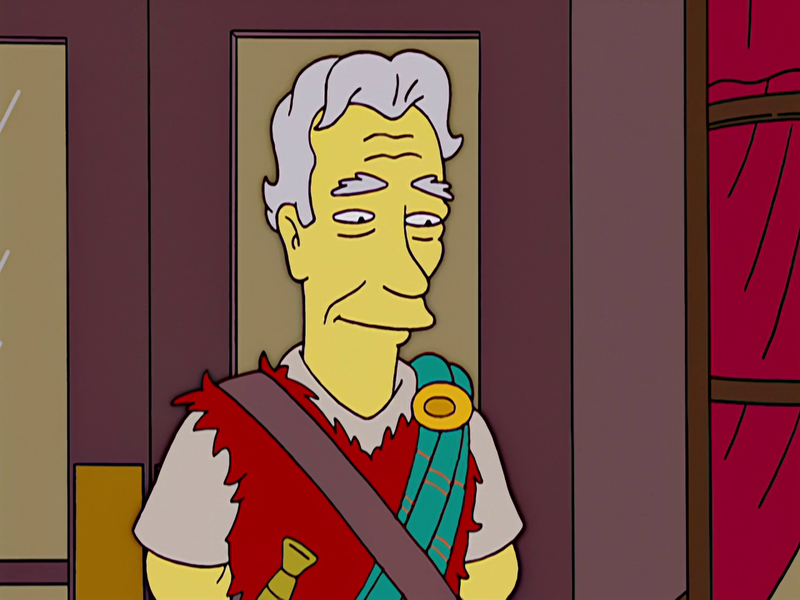 Homer is put on trial for causing harm to the Queen as well as wrecking her carriage. He calls the Queen an impostor, since her luggage is inscribed "H.R.H." which he believes is short for "Henrietta R. Hippo". Marge is embarrassed with the whole trial and Lisa exasperatedly asks Marge why she allowed Homer to act as his own barrister, to which Marge explains she didn't think it would matter as he hit the Queen of England, and wishes she could go to a vacation where neither the entire family goes to jail nor do they go condo crazy. Homer mentions that humiliating his wife and her being disappointed is punishment enough, and pleads to the Judge to sympathize with this. Unfortunately, he also refers to the Judge as a "grandmother" when stating he has to know this sort of situation, causing the Judge to furiously remove his powdered wig and state he is a man. The Queen, highly offended, demands he be executed. He is taken away to the Tower of London to await his execution, where it is planned for his head to be stuck on a pike. Near the fireplace in his cell, he prays to "the God of England" and displays the frequent mistaken American impression British people prefer to use the metric system. His family calls him from outside and Lisa tells him he can use a secret tunnel Sir Walter Raleigh built. For that, he must push a brick in the fireplace, which he manages on his second attempt (his first attempt failing as he forgot to put out the fire first). However, the tunnel leads straight into the Queen's bedroom. The Queen whistles for her guards and they rush in. Homer pleads with the Queen to find it in her "jewel encrusted heart" to forgive him. Finally, he is allowed to leave England as long as they take Madonna (who seems to be claiming she's English and not Madonna) with them to America. Just as they are about to leave, Edwina shows up and meets Grandpa. She introduces them to Abbey, her 58-year-old daughter, who looks and sounds like Homer in drag. Abe cannot bear the thought of having another Homer in his life, so he bolts. However, Homer seems to think Abbey is quite attractive, perhaps showing signs of Genetic Sexual Attraction. Tony Blair recorded his part for the episode in April 2003; It took eight months of negotiations to convince him to be in the cast, and to use himself as a voice. David Beckham was originally sought to guest star in the episode, but it was deemed that he was not famous enough in America and so was not approached. The plot of Homer hitting the Queen's carriage was recycled from a spec script Jean and Reiss wrote for The Golden Girls in which Dorothy Zbornak hit Mother Theresa with her car. This is the final episode written by longtime Simpsons writer John Swartzwelder. IGN.com named the episode the best of the fifteenth season, saying that "It may not be the best episode ever, but hell if it isn't a lot of fun", as well as calling it "extremely funny" and a "high point for the past few seasons." On January 9, 2004, this episode premiered on Sky 1, and gathered 1.1 million viewers. 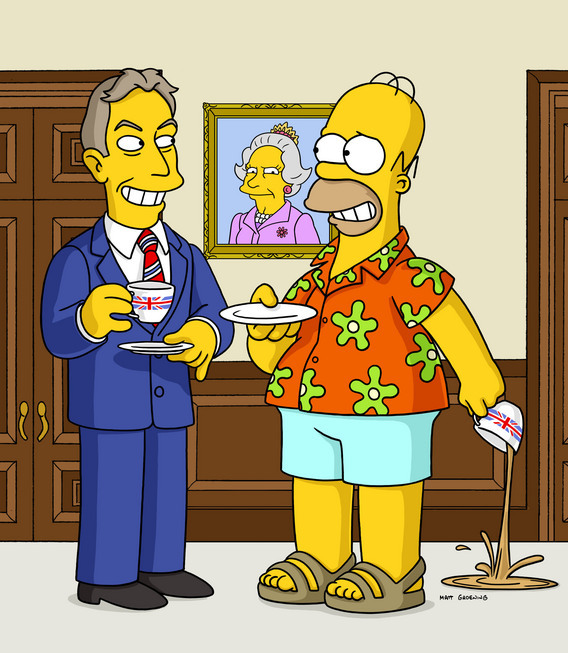 ↑ Tony Blair a 'Simpsons' guest star. CNN.com (2003-11-24). Retrieved on 2007-05-02. ↑ D'oh! The Simpsons say no to Becks!. Newsround (2003-04-10). Retrieved on 2007-04-06. ↑ 3.0 3.1 Jean, Al. (2006). The Simpsons The Complete Eighth season DVD commentary for the episode "Simpsoncalifragilisticexpiala(Annoyed Grunt)cious" [DVD]. 20th Century Fox. Modified on March 2, 2018, at 16:45.